The Doogee S60 is a solid-looking beast of a phone. Large, heavy, rugged, and sturdy, it looks like it will stand up to the toughest handling. More and more smartphone manufacturers are jumping on the rugged device bandwagon, which is not surprising since competition in this arena is still sparse, while profit margins are healthy, given the higher retail prices these handsets usually carry. The S60 is available in black, gold or silver, and the manufacturer even came up with special ‘Game of Thrones Edition’ versions. Like many of their competitors, the (Spanish) designers opted for the classic octagonal chassis (four slanted corners and four long sides) usually associated with ruggedized smartphones. At 285g, the S60 is one of the heaviest smartphones, almost twice the weight of an Apple iPhone 8. Its dimensions of 163 x 83 x 17mm are also well above average. 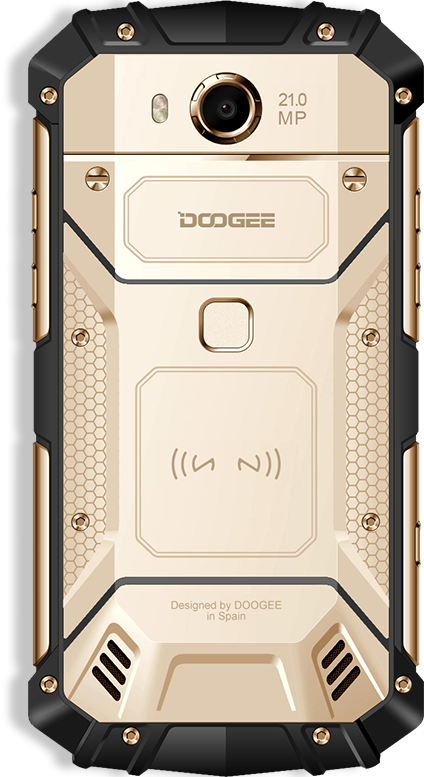 Doogee seems to heavily focus on the latter, using a combination of metal (aerospace-grade aluminium) and high-density polycarbonate plastic rather than rubber to increase this device’s resistance to shocks and bumps, earning it a well-deserved IP68 certification. The screen, a 5.2-inch Full-HD IPS display, is covered by a Corning Gorilla Glass 5 overlay, which should protect it from scratches. The IPS display boasts great color reproduction that should cater to most tastes and it looks brilliant even outside, where the S60 is expected to be used most often. There seems to be an oleophobic coating as well, as the screen is noticeably less prone to fingerprint smudges compared to competitors. The fingerprint reader is located on the back, alongside the camera sensor, the speaker, and dual LED. The SIM and microSD slot are positioned underneath a metal cover. 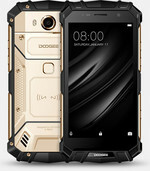 Doogee did not skimp on the components for the S60: This flagship smartphone received best-of-breed hardware (well, almost). It packs one of the most powerful SoCs available outside of Qualcomm’s stable: the MediaTek Helio P25, which is backed with 6GB of premium LPDDR4 memory and 64GB of Samsung-sourced flash memory for storage. The camera sensors are Samsung and Sony-sourced as well. The rear 21-megapixel model can only record in Full HD, despite the Mediatek P25 CPU supporting 4K. 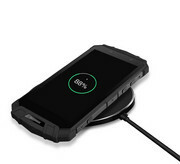 The S60 is unique amongst rugged smartphones, as it bundles both NFC and wireless charging, potentially allowing users to bypass the onboard physical ports completely. The S60 runs on Android 7.0, as expected, and does not have many extra bundled apps. One of the included applications is Zello, a walkie-talkie/push-to-talk solution that works particularly well for teams. There is also DGXender, a nifty solution for transferring files between compatible devices. The most compelling app is the aptly named Toolbox, consisting of tools that use the host of sensors on the S60 to deliver the sort of functionality an outdoor professional (working in the field or on a construction site) might expect.